Hi, I'm Joriben Zaballa and I'm a Shopaholic! Who said girls are the only one who have the shopaholic genes. We men are more notorious when it comes to shopping. Based from experience I almost spend half of my paycheck (or even more) just to buy toys. Yes you heard it right, Toys. Those little things, who are replicas of our favorite noontime cartoon characters that fights for the Earth's peace during our childhood days. When a friend notifies me about a new item released on the market, My geek shopaholic hormones will start to rage and instantly I can hear cash registers ringing in my ears. Now, if I found out that the item is already out of stock. I will surely look for a way to look for it. I will go mall hopping and even city hopping just to look for that item. Yep, despite the fact that I will be spending more for the transportation, I still don't care as long as I got what I want. The shopping don't end there. Merchants are aware of the technology revolution. More sellers are beginning to go online selling rare but cheap items. If I fail to catch the items I want on the stores, my next stop is always online to look for people who are selling their own items. As a hobbyist, buying this toys don't only serve as a hobby but as a creative inspiration for my profession. As an artist, I can easily think of ideas on my projects when I'm looking at them. And sometimes I actually play with them posing them with the other toys and relive cartoon and comic book moments. Being a shopaholic this days is really not practical, so I tried to get cheaper deals so that I can avoid spending too much. But I think to others, it is more on the obsession of spending the money itself. As long as I can, I don't want to be like that. I'm more concerned of the item itself and how will it benefit to me. This is the reason why I'm looking forward of watching Isla Fisher's upcoming film, Confessions of a Shopaholic. Because I want to see how she overcomes her obsession on her shopping extravaganza. So catch "Confessions of a Shopaholic" in Cinemas on February 18, 2009 and be inspired to shop and be crazy with Isla Fisher as Rebecca Bloomwood. OMG! Joriben you remind me of someone from a movie :D can I say it? 40 Year Old Virgin! hahahaha! hahahaha, ok lang yun. 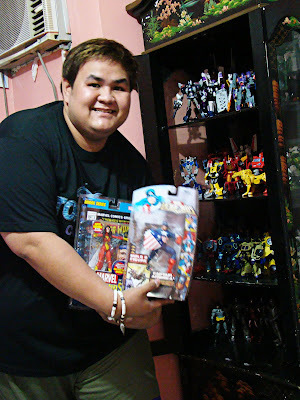 Madalas namang magkaroon ng maling impression sa toy collecting. Grabe, you have an awesome collection and quite an addiction. My bro is starting his collection, I wonder if I should stop him now. kids can't get enough of toys eh..
they started it out with hot wheels and now transformers, hay naku if only toys here as cheap as those in the US.. ang saya sana di ba..
Well, nasa sa inyo na yun kung pipigilan nyo sya. Turuan nyo na lang siyang magbudget, hehehe. di ako nakapunta sa Libis last December. Sayang. Woah! shopaholic and Toy-aholic... Massive collection hmm ako din kaya sali sa contest... Hmm Culture Crash at Indie at Local Pinoy Comics-aholic. By the way astig na ng page mu Jori ah. Like the You Embed Tube, kung may uploads lang ako gagamitin ko din yan kaso not that much of a vlogger. Zsa Zsa Zaturna ah, inform me. Jori! WE WON! :) See you soon. Jori! Congratz at winner ka sa Nuffnang! Haha! Grabeh namimiss ko na makita toys mo sa Yehey office! Wee! Yeah own them. It is a two year worth of acquisition. Wait till you see my friend's collections. Mas marami pa. Thanks. Not really expecting na manalo pa dahil I know maraming sumali hehehe. Thanks again. Your buying impulses remind me of the men in my family :). Di lang talaga girls, noh? Hi! Congrats for winning the contest... kanino mo ibibigay ang Gucci bag mo?ipa-raffle mo na lang sa amin hahaha. congrats sa atin! pero feel ko talaga hindi ako mananalo ng gucci bag! ang gaganda ng entries nyo e! Malay mo ikaw ang masuwerteng mapili ng mahiwagang Gucci Bag hahahahaha.